You are here: Home / beauty / Robert Craig Hair Coloring Kit: Color to dye for! 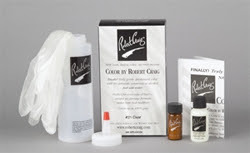 Robert Craig Hair Coloring Kit: Color to dye for! If you told me that I could color my hair without any mess and that the dye would be completely void of scent, I wouldn’t believe you. And I honestly didn’t when I was first approached about Robert Craig Hair Color. I had never heard of it and have used other hair dyes in the past that have said it was without scent, but then couldn’t live up to the claims. When I opened the hair coloring kit I was surprised to find a small bottle of white powder…where was the liquid or gel I wondered. However, this is how this hair kit is mess free. You simply put warm water in the bottle, add the powder and shake. Voila! The warm water activates the powder to turn it into a mousse-like substance. I was a little nervous reading the directions, as it continually mentioned that the dye would stain, but when you apply it to your hair it comes out looking like the carbonated foam from when you pour your soda too fast and it quickly adheres to your hair. So nothing dripped and I kid you not, I didn’t get any dye on my face whatsoever. My hair is long so it did get a bit on my shoulders, but I quickly wiped it off (I wasn’t wearing a shirt just in case) and my skin didn’t stain. Once my hair was saturated, I left it in for 30 minutes, rinsed and then washed it with the sample of shampoo included in the kit. That was actually surprising too, as most hair coloring kits come with conditioner and not shampoo. My hair color came out amazing. It was shiny and healthy looking and just plain gorgeous. The price is just the same as the other hair coloring kits out there. The only difference is that there is no alcohol, peroxide or ammonia in the Robert Craig hair coloring kits. So it was a very positive mess free and fragrance-free experience. Definitely a product to look into for your next hair coloring experience.